“Let’s do the hike out to that pretty rock,” she said. As soon as my sister Laura confirmed she could come to Fayetteville for a weekend in October — we made plans. The pretty rock it is! Jeff and I had taken Colt out there a few years ago, but he didn’t really remember it, and Laura and Becky had never been. So we Googled some directions, filled up the gas tank, grabbed some granola bars, and headed out. Whitaker Point. 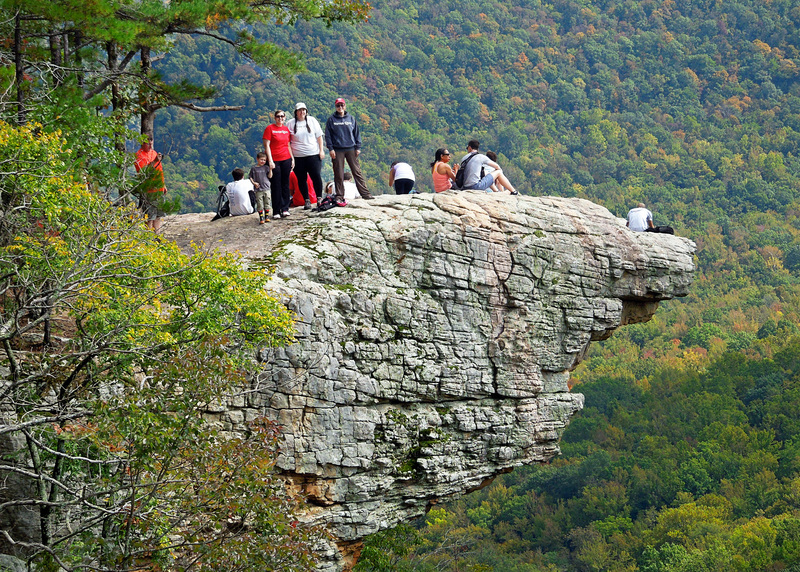 Or Hawksbill Crag. 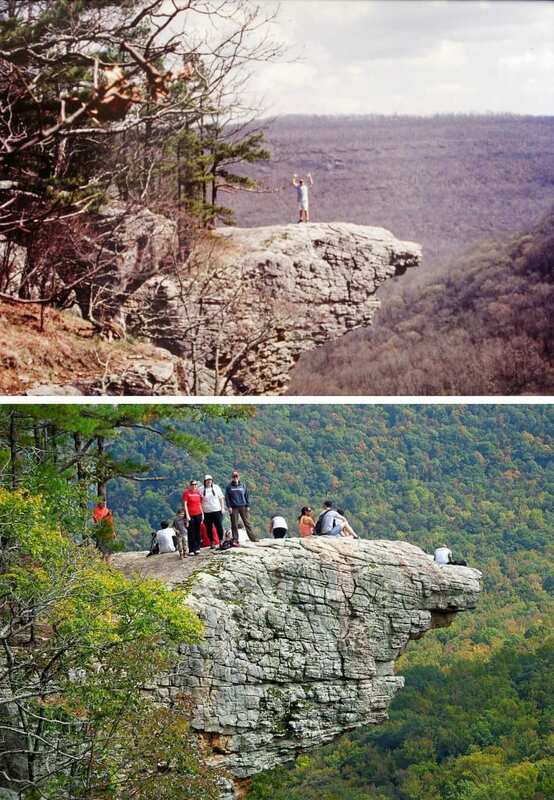 Said to be the most photographed spot in the state of Arkansas. Directions to the trail head are a little tough to come by as nothing out there is marked. The last step of our directions was “turn right onto the unmarked gravel road just before the Buffalo River bridge”. It’s like looking for the Bat Cave. It was an absolutely gorgeous day so we weren’t alone in our plans. Parking was crowded at the trail head, but the trail itself was pretty quiet — we passed a few groups of college kids and a handful of Boy Scouts. I had my camera – of course – and Colt started pointing out things that were “beautiful” and requesting I take pictures. So I handed him my (LifeProof-protected) phone and let him go for it. He quickly discovered the critical difference between snapping photos while wandering the Farmers’ Market and snapping photos hiking through the woods is the required level of dexterity. 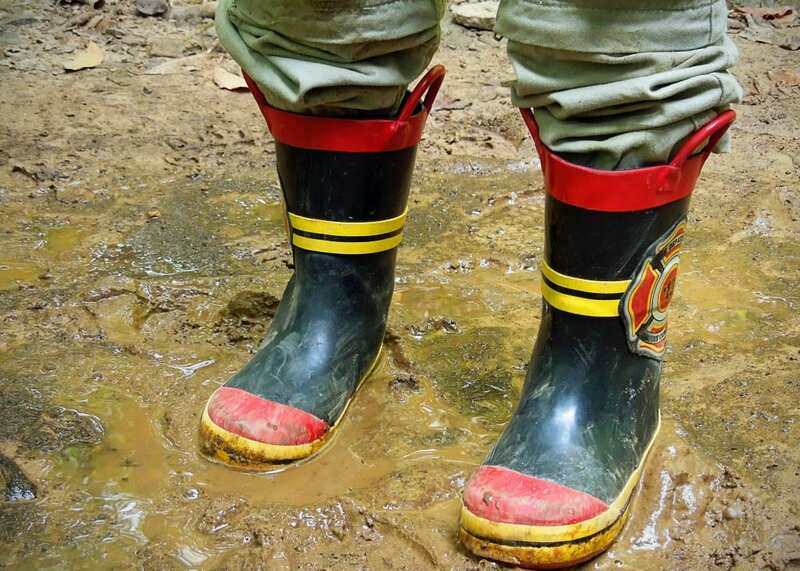 The ground is uneven, there are rocks and roots and mud puddles to make it interesting — we were finally able to convince him that he shouldn’t “hike and click”. Here it is. Colt’s un-edited, un-cropped photo journey through the Buffalo River wilderness. The hike from the car to the rock is only 1.5 miles, but the drive from Fayetteville (2 hours) had taken longer than I anticipated and we were flirting with lunch time. The granola bars in my backpack would only fend off the crankiness for so long, so I was relieved to see the crag come into view and we could take a snack break. The rock looks pretty crowded in this photo — and it kinda was. From what we saw and heard, there was a group shooting a student film and at least four other groups like ours — out enjoying the day. But none of it was able to detract from the majesty of the view from the point. It’s incredible. We missed the peak of the leaves by about 10 days — it almost makes me wanna head back out there. Laura hadn’t picked just any old weekend to be in Fayetteville. She was there — and 24 hours later my parents would be, too — so that we could all be together for THAT week. The week of October that starts with Tom‘s birthday on the 10th and peaks with his KIA date on the 14th. The week we get together, tell stories, and try to laugh a lot. 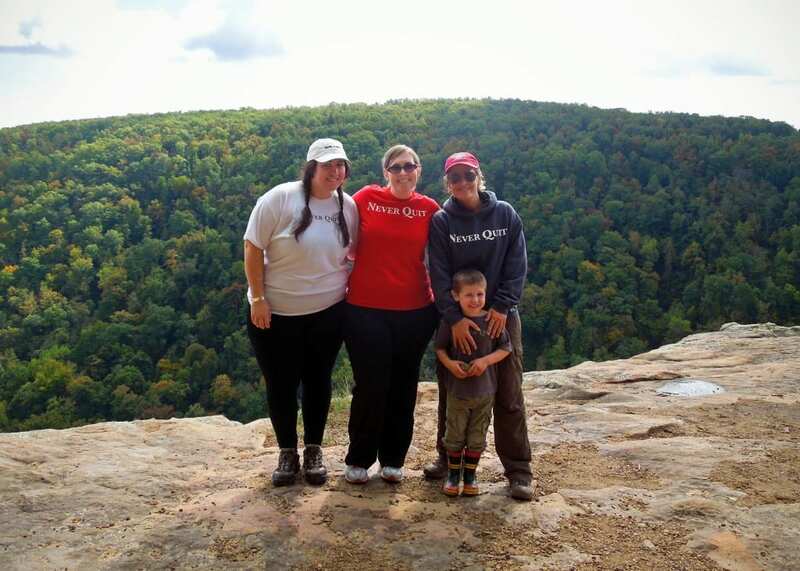 We knew we had to take a Keeping TIME photo at Whitaker Point — especially this weekend. Keeping TIME is a project created by the 1LT Tom Martin Memorial Foundation. 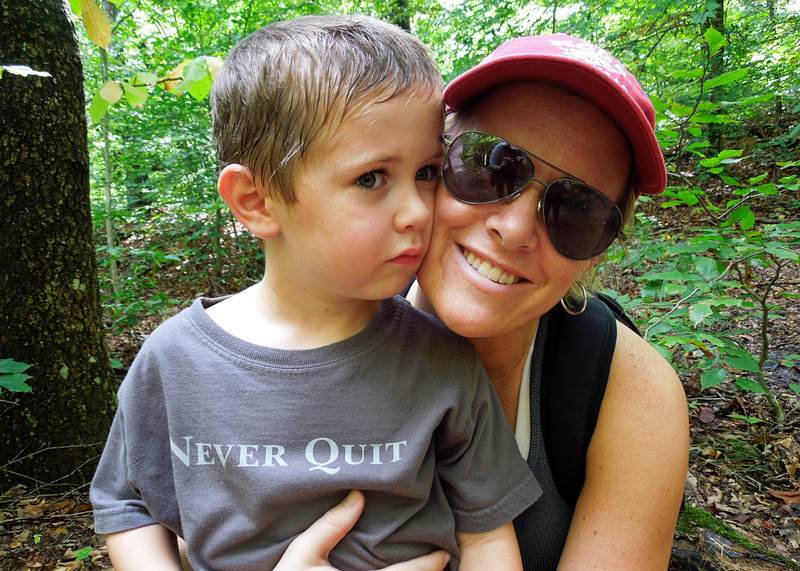 It stands for Keeping Tom In Mind Everywhere — and since it was established about a year ago the Foundation has received hundreds of photos from all over the world — of people wearing Tom’s “NEVER QUIT” spirit while they do something fun or challenging or noble. It’s been an incredible way to reconnect with many of Tom’s old friends and classmates, and introduce him to a whole new world of people now living his spirit. Everyone we met on the trail that day seemed to read our shirts aloud to themselves, and sometimes under their breath. It was the perfect theme for our hike. 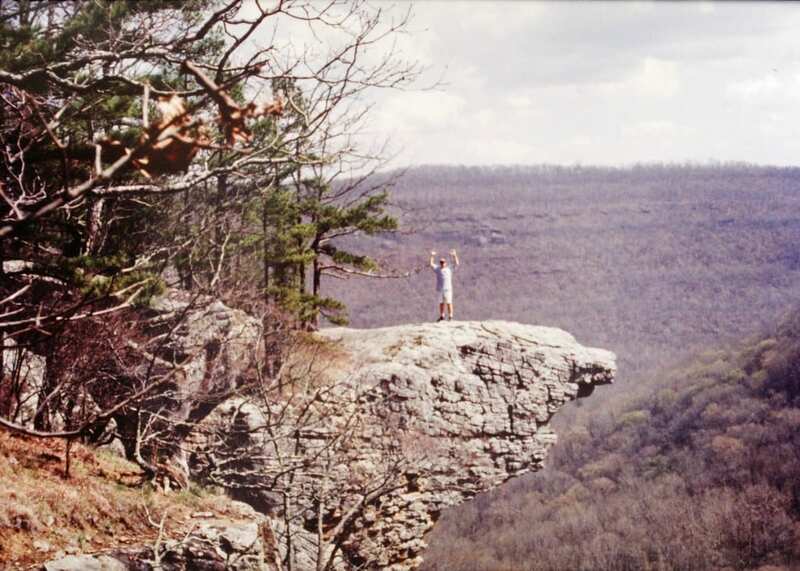 And after we got back that afternoon and posted our Keeping TIME photo to the Foundation Facebook page, we were reminded by our Uncle Jim that he and Tom had once hiked out to Whitaker Point as part of a Buffalo River trip with the Boy Scouts years ago! My parents dug out a photo Uncle Jim took of Tom out on the rock. We think this is about 1994. I love that they found this photo. It makes our hike so much more special. And the way we’re standing — it’s as if we left a spot for him to stand right there with us. The hike back to the car was a little muddy, a little sweaty, and a little whiney — Colt even managed to negotiate a piggy-back ride from Becky for the last quarter mile. You can’t beat exhausting physical activity that’s also good for the soul — and if you’re beyond cellphone reception, that’s always a bonus. What a way to start our weekend.